Friday will be warmer than Thursday with mostly cloudy skies, according to the National Weather Service in Brownsville. Winds are expected to increase later this morning with 25 to 30 MPH gusts possible. 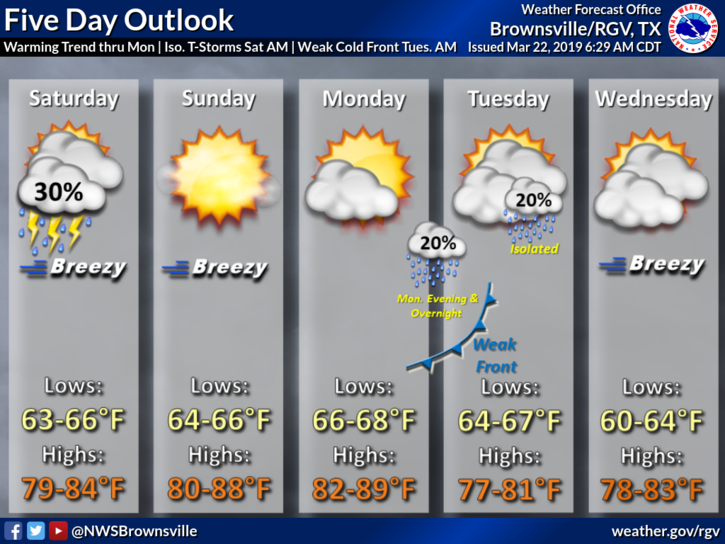 McAllen is expected to reach 80 degrees while Brownsville will be 79 and South Padre Island 73. On Saturday, breezy conditions will continue and there is a 30 percent chance of thunderstorms. However, temperatures are expected to be warmer than Friday with temps ranging from 79 to 84 degrees. On Sunday and Monday, temperatures in some areas of the region may be in the upper 80s.